Continuous upgrading and a “vocation” for farming are two keys to the success of a cooperative that could serve as a model for boosting agriculture in Cuba. HAVANA, May 21 2013 (IPS) - “The people are the only thing that matters,” says agronomist Miguel Ángel Salcines, who then goes on to list a series of other “secondary” factors that have turned Vivero Alamar, an urban farm on the outskirts of the Cuban capital, into a rare success story in the country’s depressed agricultural sector. “We offer flexible hours, relatively high wages, and professional upgrading, among other benefits that make the cooperative an attractive option. This is how we attract high quality human resources, who are crucial today in order to produce more organic food,” said Salcines, the president of Vivero Alamar, where production has been chemical-free since 2000. The cooperative’s recipe for success also includes transparent accounting, equitable profit sharing, interest-free loans for the workers, free lunches, and support for women workers with young children or others in their care: they are allowed to arrive up to an hour later than the official beginning of the work day, at seven in the morning, Salcines told Tierramérica*. Human capital played a decisive role in raising production at this urban agriculture venture, founded in 1997 on an initial 800 square metres of land in the community of Alamar, around 15 kilometres east of downtown Havana. This is why Salcines believes that the key to achieving food security in Cuba lies in agricultural workers with a “vocation” for farming, as well as training. In 2012, world food prices skyrocketed as a result of poor crop yields in various centres of agricultural production, such as the United States. The Caribbean countries, which are net food importers, suffered the greatest impact in the region, according to the Economic Commission for Latin America and the Caribbean (ECLAC). Less than five percent of the population of Cuba suffers from malnutrition, but the country was forced to spend over 1.633 billion dollars on food imports last year, an unsustainable expenditure for an economy in crisis for more than 20 years, specialists say. Reducing this massive expenditure by raising domestic food production remains a challenge for the government of President Raúl Castro. In fact, in the first quarter of this year, the National Office of Statistics and Information reported a 7.8 percent decrease in agricultural production other than sugar cane. “There is a big demand that needs to be met, which is why we are able to sell everything we grow,” said Salcines, one of the founders of the cooperative, which now covers a total of 10.14 hectares and produces more than 230 different crop varieties (primarily garden vegetables, as well as some fruits, grains and tubers) in greenhouses and open fields. In the midst of a generally inefficient agricultural sector, Vivero Alamar has achieved consistent growth for more than 15 years, thanks to the constant upgrading of its organic farming methods, which have even earned the praise of the director-general of the United Nations Food and Agriculture Organization (FAO), José Graziano da Silva, who visited the cooperative earlier this month. In 2012, they produced 400 tons of vegetables, 5.5 tons of medicinal and “spiritual” plants (used in religious rituals), 2.6 tons of dried herbs and spices, and 350 tons of worm manure. They also produced 30,000 ornamental plant and fruit tree seedlings and three million vegetable seedlings, some for their own planting needs, others for sale to other farmers, reported Salcines. Fresh vegetables, especially lettuce, are the products most sought after by the local residents in Alamar, who have begun to learn in recent years – like people in the rest of the country – about the benefits of including more greens in the traditional Cuban diet of rice, beans, “viandas” (starchy tubers and plantain) and pork. “The first time we planted cauliflower, in 2000, it all got left in the fields, because nobody knew what it was,” plant health engineer Norma Romero told Tierramérica. 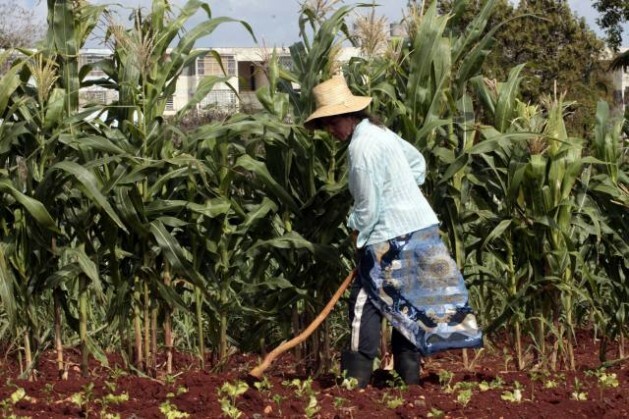 In her view, one of the most important contributions made by the more than 33,000 urban and suburban farms in Cuba has been the expansion of access to and consumption of vegetables. Thanks to a new initiative at Vivero Alamar, recipes for the preparation of different vegetables and mushrooms accompany the lists of products available at the cooperative’s sales outlet, as part of its business and educational strategy. The shelves also stock pickled vegetables, fruit preserves and garlic paste, produced through its own small industry sideline. Although organic produce can be prohibitively costly in other countries, the organic fruits and vegetables sold by Vivero Alamar are actually priced lower than those produced with agrochemicals and sold in private farmers markets, where the prices are set in accordance with supply and demand. “The affordable prices are the biggest attraction. A head of lettuce costs four Cuban pesos (five cents of a dollar) here, and everywhere else they charge 10 pesos,” regular customer Sonia Ricardo told Tierramérica. “The vegetables here are fresh, they have no pesticides, and the service is really fast,” she added. Despite these low prices, the cooperative is able to earn good profits, production chief Gonzálo González assured Tierramérica. Eighty-five percent of its products are sold directly to the population, and the rest go to restaurants like La Bodeguita del Medio, a major tourist attraction in Havana. Since it first started out with just five people, Vivero Alamar has progressively moved towards a closed-loop farming system that reduces waste and environmental damage. Vivero Alamar raises bulls to obtain manure, has set up “worm bins” to produce earthworm castings, another organic fertiliser, and breeds mycorrhizal fungi (which attach themselves to the roots of plants and promote their growth) as well as insects and microorganisms that can boost crop yields naturally. The cooperative has also established links with 17 scientific centres for the incorporation of new organic farming techniques and products. Today, the 195 people who work here are striving to raise production by 40 percent to reach the farm’s full potential output, and have also expanded into raising rabbits and sheep, in order to include meat in its sales to the public and improve protein consumption among the neighbouring population, some 30,000 people. The staff is made up of 175 cooperative members and 20 employees, and boasts a high overall level of education, with 92 university graduates and 42 technical college graduates. Women currently account for only 46 of the 195 workers. “A farm can do much more than produce food,” commented Salcines, as he watched a group of foreign tourists who had booked a guided tour and organic lunch at Vivero Alamar.